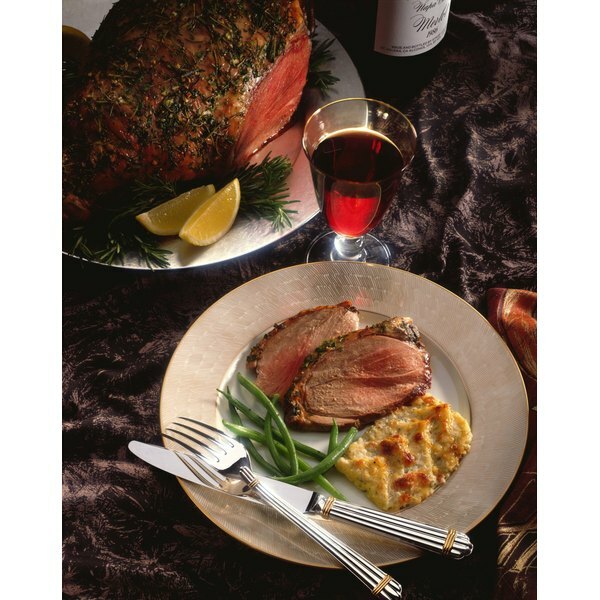 Boneless leg of lamb is easy to slice and serve. Grilling a boneless leg of lamb is an effective way to impart a unique smoky flavor to the meat, but it is also a preferred method for healthy cooking. Grilling allows fat to drip off and away from the lamb, cutting down calories without sacrificing flavor. Because a leg of lamb is fairly thick, indirect grilling is preferred. With indirect grilling, the temperature is kept low and the lamb is cooked over a long period of time. Cut away any excess fat from the lamb with a sharp knife. Excess fat can cause flare-ups and burn your lamb while on the grill. Prepare your gas or charcoal grill for indirect heat by pushing all the coals to one side or by igniting only half the burners. The key is to create a hot and cold zone on the cooking grate. Aim for an overall grill temperature of around 250 degrees F.
Season your lamb with salt, pepper and any of your favorite seasonings or marinades. Place the lamb on the cool side of the grill, cover and cook until the interior temperature is 145 degrees F. A 3 pound leg of lamb should take approximately 1 1/2 hours to cook. Remove the lamb from the grill and allow to rest for at least 10 minutes. Resting the meat allows the juices to reabsorb into the lamb, preserving tenderness and juiciness. Add water soaked hardwood chips to your gas burners or hot coals to add unique smoky flavors to your lamb. Try walnut, hickory, maple or pecan wood. Wash any cookware used to handle the raw lamb with hot water and soap to kill any bacteria that might cause food borne illness if ingested. USDA: Food Safety Education: Is It Done Yet?